Tragedy of Omelette: Prince of Denny’s. Image – Bottoms Up Productions. When I first read the title of this show, I thought for sure that it would be a parody of Hamlet set in a Denny’s restaurant. I’m guessing I wasn’t alone in that assumption. 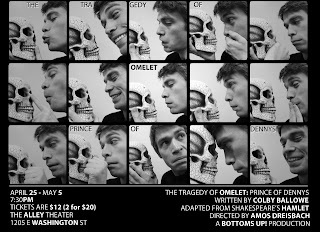 The Tragedy of Omelet Prince of Denny’s went up at the Alley the other night and is the final play of the season for Bottoms Up! Productions. 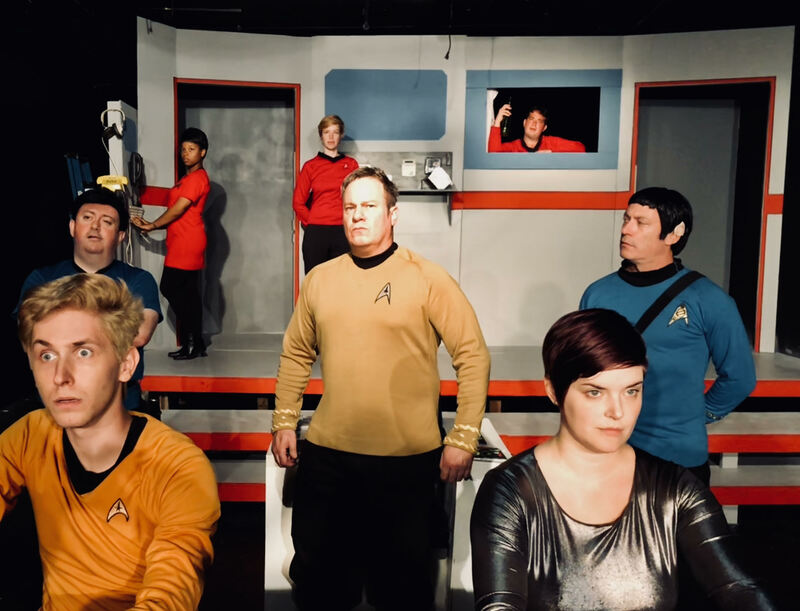 The play, in fact, has nothing to do with omelets or diner chains of any kind: it’s pretty much Hamlet with some modern slang thrown in just for fun. That leaves The Tragedy of Omelet somewhere along the spectrum of a full-on parody, and an actual modern translation. I wish the author had gone one way or the other, because right now the play feels like it’s in that squishy place between wanting to be a parody and also wanting to revere the text it is mocking. There is a great deal of potential in treating Hamlet as a farce, because on many levels the play is pretty preposterous. There are ghosts, there are accidental killings, there is mass death, and most of the characters go completely insane by the end. It’s material ripe for parody. But this script relies too heavily on stereotypes and shock value jokes that tend to fall flat after a while. Even David Miller with his pencil-thin beard and full commitment to be the “playa king” couldn’t quite bring us to the point of hilarity. A quicker pace, shorter scenes and less dialogue might have helped. 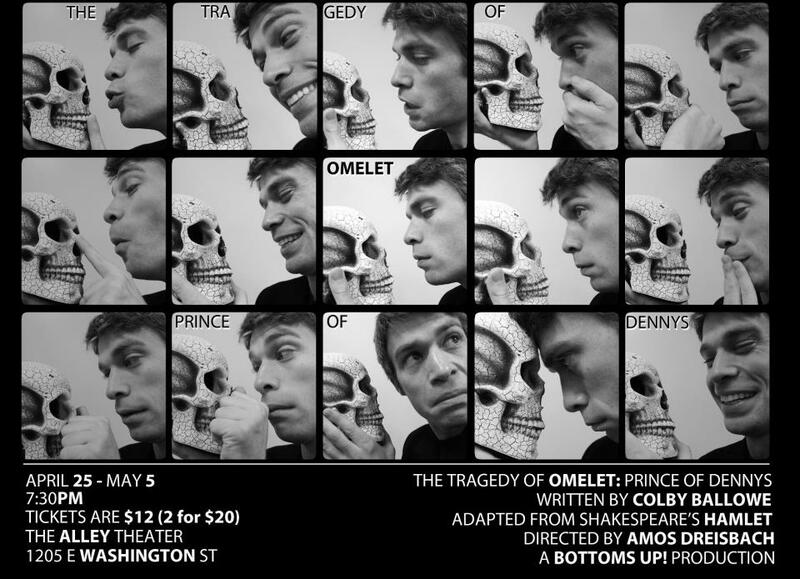 Omelet needs to move like a comedy, and unfortunately in some scenes it moves in a bit like, well, Hamlet. That being said, the actors in the production do quite a nice job and manage to pull off many funny and believable moments. Blair Boyd was very genuinely funny as Ophelia, who gradually becomes more and more insane throughout the production. Boyd captures, in her own charming way, the excessively shrill, needy essence of the character. 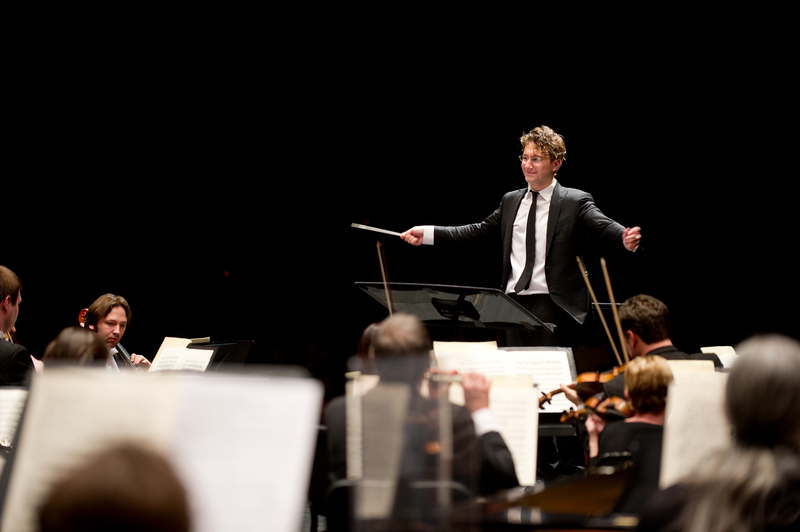 Corey Music is also strong as Claudius. He demonstrates good shows of temper and strong comic timing, and there’s a funny bit when he is in the church praying. He’s so winning because he’s so genuinely baffled that everyone is accusing him of these crimes. Conrad Newman was also good as Hamlet, though there isn’t really anything brooding about him. He has more of a matter of fact energy, which worked as far as the comical aspect of the show. There could have been a stronger choice made for Hamlet; he’s not as extreme as the other characters. More contrasts and surprises would have made this role work better. The stronger scenes were between The King and Queen, and also between Ophelia and Hamlet. Gertrude is Hamlet’s drunken mother, and this aspect of her character ties in nicely at the end when she insistently drinks from Claudius’s poisoned goblet. There is also the revelation that Claudius did not in fact kill Hamlet Senior, which is a great idea, and a good twist. More of the plot should have built up to this moment; it’s really the twist that pulls the whole play together. Thursday and Friday, May 2 and 3; and Sunday, May 5. The show starts at 7:30 p.m. Tickets are $12 dollars, or 2 for $20.